David and Flick Warwick would like to associate this peal with David's grandfather, Shirley Burton, who was a ringer at Leicester Cathedral and would have rung on these bells when they were in the tower at St. Mark's Leicester before they became unringable. 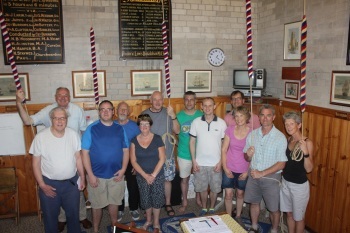 Seven of the bells from St Mark's form part of the ring of 12 at Goulburn. A nice connection with our tour. Last updated Wednesday, 25 January 2017 at 11:44:40. First submitted Sunday, 22 January 2017 at 07:46:46 by Ruth Curtis. Sent for publication in The Ringing World on Friday, 7 April 2017 at 09:38:55. This performance has been viewed 2043 times.